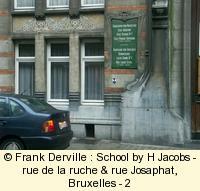 In 1900, the Bruxelles of nowdays was divided in a lot of little surburb towns that rounded the inner city. In the second part of the XIXth century, the city wall was destroyed to make a circling boulevard. 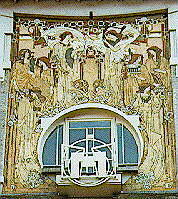 The inner city was not very touched by Art Nouveau because there were not many destruction of older quaters but the surburbs like St Gilles/Sint Gillis, Ixelles/Elsene, Forest/Voorst and Uccle/Ukkel feature hundreds of Art Nouveau buildings or villas that you still can see nowdays even if some of them are in a pity shape. 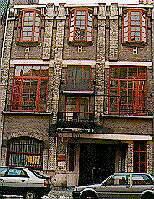 This building is very rational with an AN decorative style : look at the balconies. 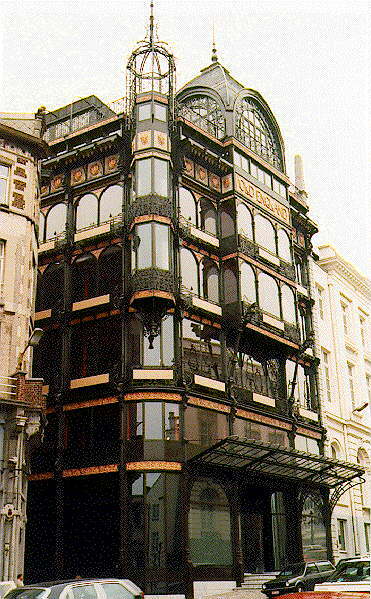 It is considered by some critics as a starting point of the Belgian modern architecture movement. 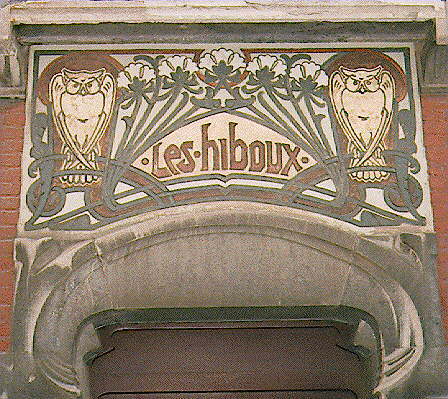 Don't forget to look at its neighbour 55, boulevard Brugmann which features owls in the door sgraffito and top sculptures. 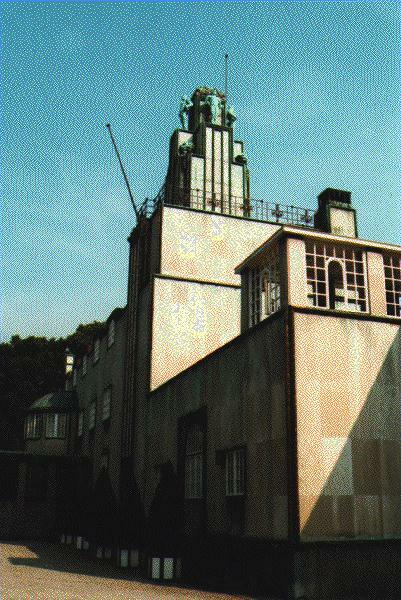 The Stoclet Palace is considered sometimes as the first Art Deco work because of its geometrical shape which is not very Belgian although the Belgian Art Nouveau has become more and more geometrical after 1903. 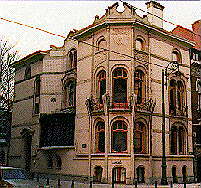 It was built by Hoffmann, a viennish architect who created the Wienner Werkstate. 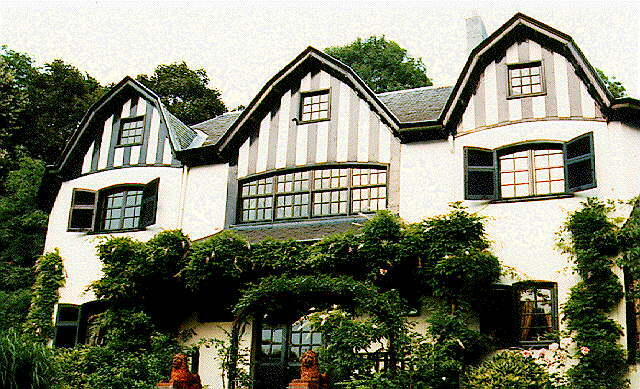 This palace was designed until the ultimate detail including the tea spoons, the bathrooms,... 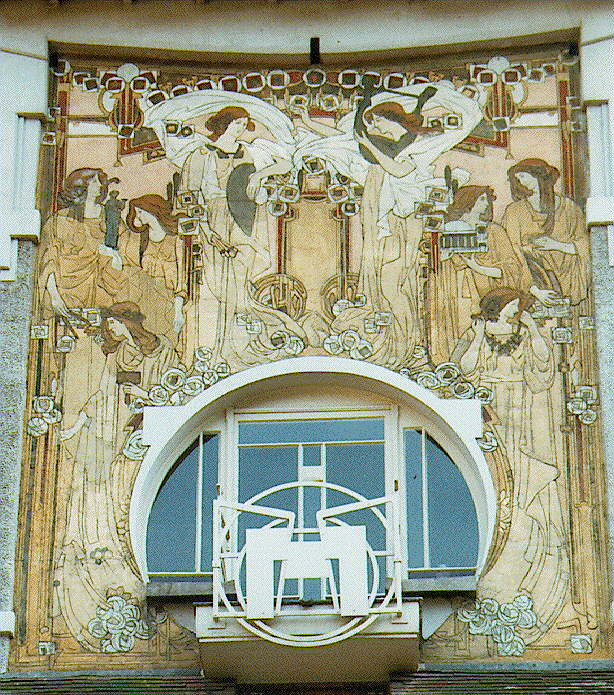 The paintings were designed by Klimt himself. 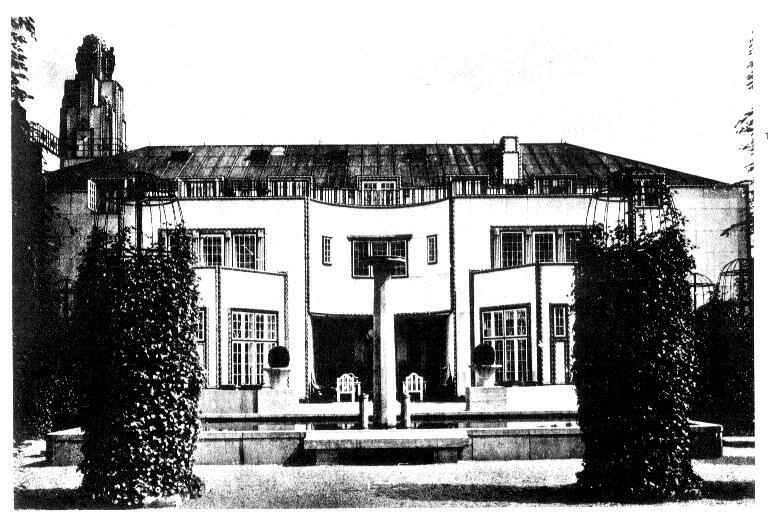 Bloemenwerf, avenue vanderhay, Uccle by VAN DE VELDE. 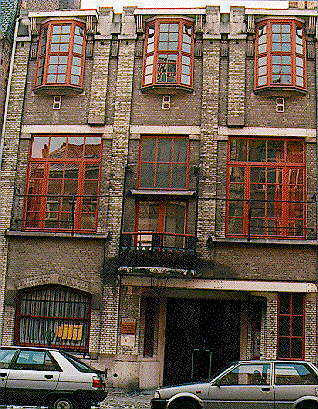 SaintCyr's house, Square ambiorix by STRAUVEN. The two following buildings are 200 meters away from the King's palace. 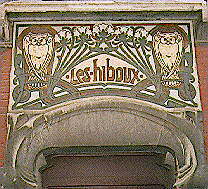 Flower shop, 13, rue Royale, Bruxelles by HANKAR in 1898. The most exhuberant shop window I have ever seen. You will understand what curve means. See the door page : the transparent door is the one of this shop. 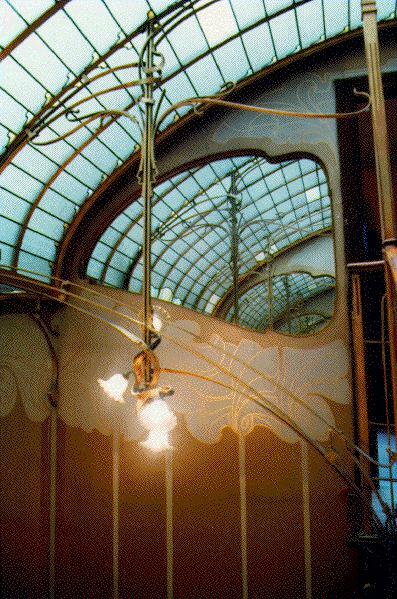 Cheap and easy guides to visit Art Nouveau in Bruxelles. Ask the tourist office, there used to be a free photocopy with a map and the most well known AN buildings. 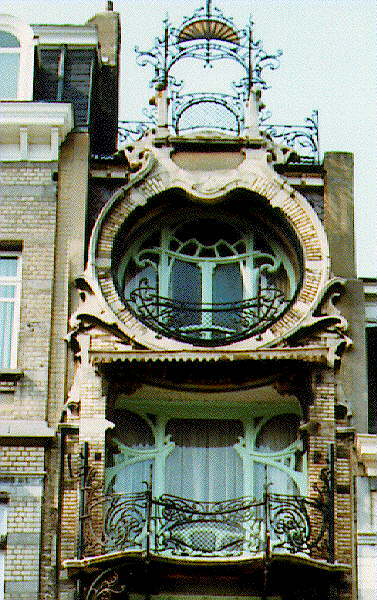 Now that Art Nouveau is considered as a touristic opportunity there should be more. But perhaps more expensive. 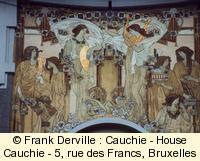 As a beggining I have used "Promenades Art Nouveau à Bruxelles". Price BF 70. Edited by Kredit Bank. It gives maps of the most AN building concentration areas (except inner town). It is worth to make it on foot but do it little by little there is stuff to see during a month. Pros: Good value, the best that I know to visit AN in Bruxelles. Cons: Maybe to much data, it is hard to know the best to see on the map because major buildings are specified outside the map by bold face. Some would say that there are not many photos but it is not the aim of that cheap guide. The A.R.A.U. edits an AN guide with an inner city map of Bruxelles. It points at 78 buildings. The guide was pointed out by JP Lamps. 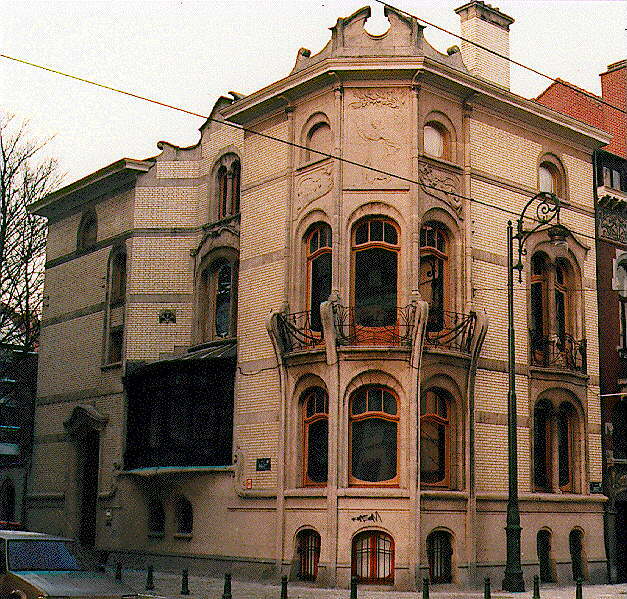 The A.R.A.U also propose some guided tours about AN in Bruxelles. 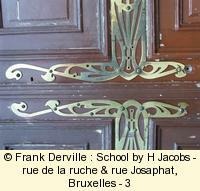 It is an opportunity to access to AN buildings usually closed to public. 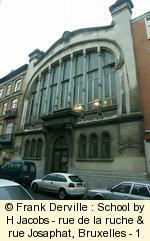 Address: 55, Bd Adolphe Max; phone: (+32) (02) 219 33 45.